How could you be the world’s best salesperson, then keep advancing quickly in everything you and your customers do? You won’t need to schedule a meeting for next Tuesday, fly to that city, then drive there through traffic while hoping the right people actually show up or take the time. Instead, you will be able to say, “Hey! Do you have a minute?” and work together instantly, everywhere, far more effectively. Example: Suppose you sell medical diagnostics equipment to hospitals and diagnostic facilities — you could be the manufacturer, distributor or integrator. You’re talking to a new prospect who wants to see an MRI installation in an independent diagnostic center. You “take” him digitally to a diagnostic facility, chat with its director, “see” their facility and learn their management priorities and results. Then you “take” him digitally to other diagnostic centers quickly, to illustrate how they maximize image quality, uptime and utilization. In minutes your prospect has experienced exemplary facilities thousands of miles apart, and personally seen how much your company can deliver. You show how your staff provides total support with a continuous Shared Life Space so every appropriate person at the new facility has continuous hands-on guidance. This starts with their financial models and projections so they’re done quickly and presented well. It continues with their buildout, hiring, training and opening, Then you maximize their technologist accuracy, management control, facility utilization and patient satisfaction. Shared Spaces let your company deliver best practices every day, with one turnkey sale. 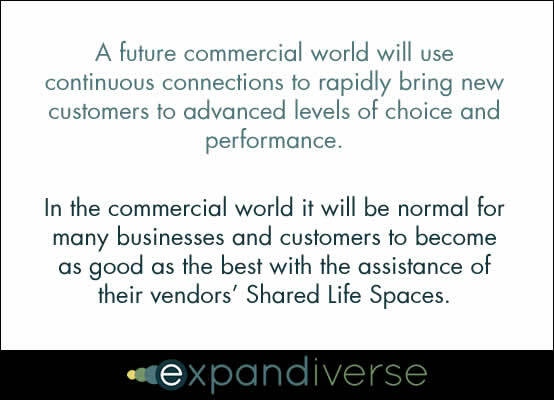 Changes: A future commercial world will use continuous connections to rapidly bring new customers to advanced levels of choice and performance. Some of its advances: Digitally “take” prospects to leading installations, talk to real people there, show their processes, make it easy to to buy, finance, install, operate, manage, troubleshoot, support and upgrade. Continuous connections make advanced performance direct and routine, with constant demonstration, sharing and distribution of new “best practices” and the latest advances. Tomorrow’s world: Our normal commercial world will run on seeing the best everywhere, then delivering that. It will be normal for many businesses to become as good as the best with the assistance of their vendors’ Shared Life Spaces. Then they’ll use their own Shared Life Spaces to extend their superior products and services into their customers’ lives and everyday uses. When you need anything, immediately focus in your vendor to see, receive and become the best without traveling there. If needed instantly focus in other vendors, services or products from multiple locations. Choose and reach each of your goals at the highest levels, without waiting or traveling. A commercially successful world: You’ll work in an Expandiverse that helps large numbers of companies see how to be “the best” commercially, and guides them as they make “the best” their normal standard. Every vendor will know how to provide what its customers need through continuously connected Shared Spaces. Customers will feel its normal to live in a world that knows them and serves them personally with the best options, always on and available, whenever they choose to focus in. You win! Image credits: The first image is credited to Shutterstock. The second image is copyright Dan Abelow. 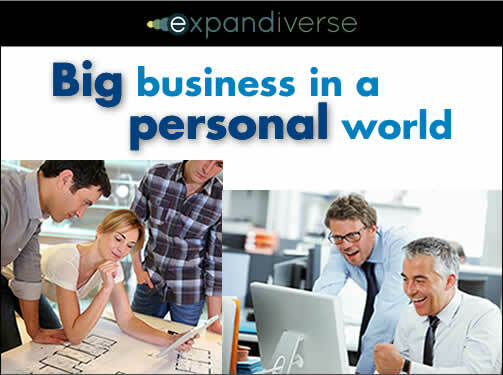 Share the post "In B2B, make your customers the world’s best at everything"